Comments Planetary gem therapy is not just a tool for karmic life map change limited to the elite. 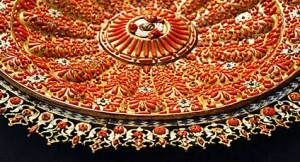 The maharatnas are precious and command a high value, which may appear to be a stumbling block to those interested in implementation of gem therapy. However, the availability of upratnas makes it highly viable option for masses and not just the classes. There is way for the willing. Featured today is a fine natural heliodor from Brazil of 2.34 carats set in Sterling silver as a Jupiter talisman ring. 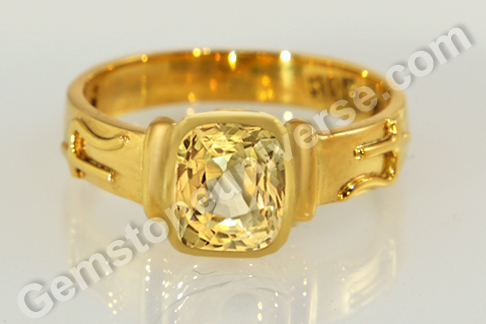 The oval shaped gem has fantastic clarity and appealing golden yellow color with a hint of brown. The appearance of the gem is electric and the color has a metallic sharpness to it. 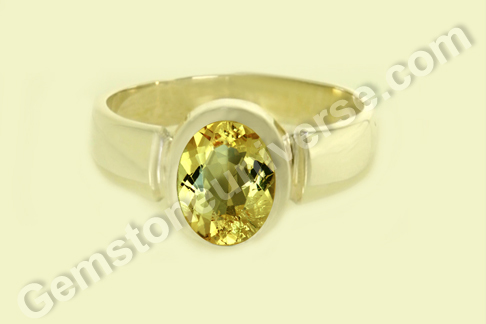 Heliodor is the substitute gem for yellow sapphire and is the gemstone of Jupiter/ Brihaspati/ Guru. This upratna or substitute gem of pukhraj is and is the jyotish rashi ratna for zodiacal signs/ rashis of Sagittarius (Dhanu) and Pisces (Meen). Heliodor is a variety of the mineral group beryl, which gets its color from traces of iron. Heliodor is yellow beryl that has hint of green or brown in varying degrees. Untreated Heliodor from Brazil, characteristically has a slight brown tinge of color. It is different from golden beryl that is golden yellow in color. One must be careful while purchasing heliodors, for they are irradiated to enhance color. Better intensity and saturation in a colored gemstone fetches a better price. 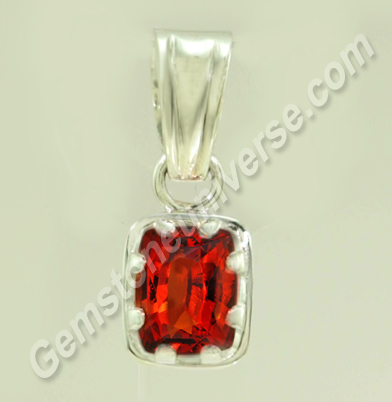 Comments Gemstones such as the one featured today are what jyotish gemstones should be like. The perfect example of what makes the cut on the stringent parameters required for a jyotish rashi ratna. Soak in the blissful sight of a natural and unheated Ceylon Blue sapphire set in silver as a Saturn Talisman ring. The treatment free blue sapphire of 3.78 carat has a fantastic jyotish weight along with a coveted rich silky sky blue color. The oval shaped gemstone has excellent clarity and electric lustre – hallmarks of a fine natural gem. In Vedic astrology, natural Blue sapphire or neelam is the gemstone of Lord Saturn/ Shani and is the rashi ratna for the signs/ rashis of Capricorn (makar) and Aquarius (kumbha). For best results in planetary gem therapy one must use a jyotish quality gemstone only. Please note that in this particular blue sapphire, on display is master lapidary work. The fantastic cutting and polishing of the gem has lent it a matchless brilliance – almost adamantine (diamond like) in nature. The symmetry and dimensions, in fact the aesthetic appeal is completely determined by the cutter who is the artist in the world of gemstones. Flaws to avoid in a Pearl used for Astrological Purposes- A brief discussion of a Jyotish Pearl? Comments Indian sacred texts are detailed and exact in outlining the desirable characteristics in selecting a Natural pearl that gives good results for harnessing the powers of the moon for planetary purposes and at the same time give details about the doshas/ characteristics to be absolutely avoided that render a Gemstone useless for Jyotish Purposes. 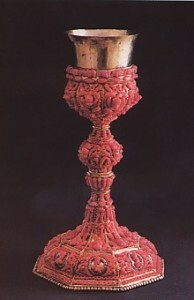 These flaws have to be looked into carefully as these results in negative and harmful results.Among the desirable characteristics listed are that the Pearl should be fully natural made under accidental conditions in nature, should have a fine radiant color, the surface should be lustrous and shiny and it should be of shape pleasing to the eyes. 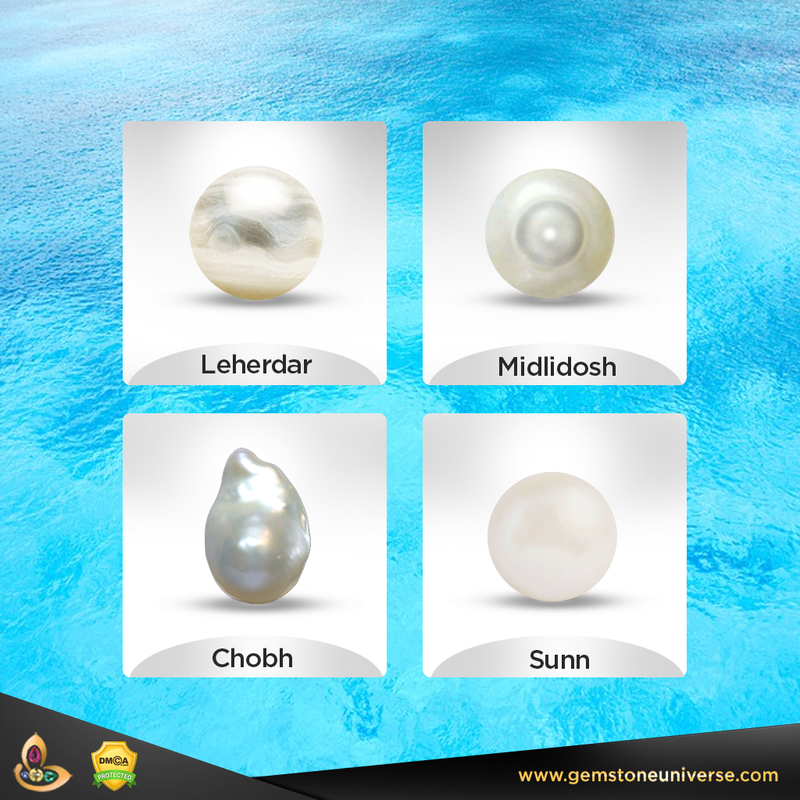 This information is available only to a selected few and it is absolutely vital that when you are wearing a Natural Pearl for Astrological Purposes you ensure that your Pearl is a True Jyotish Gem. Such a Pearl will bring you good luck, solutions, good health and vitality. 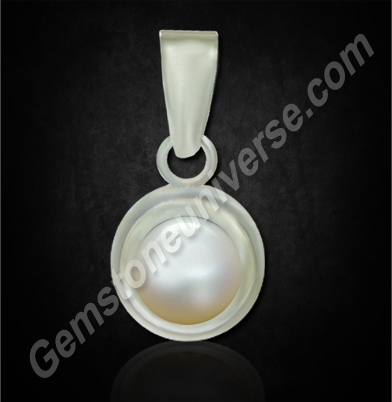 Featured above is a True Jyotish Pearl free from any flaws. See the lustre, radiant white appearance, solid 2+ carat weight and imagine the power it possesses for destiny recalibration. To see a detailed article on fake pearls please click here. Deo Amabiles Et Hominibus-Pleasing to Men and to God! Comments Natural gemstones are real marvels of nature. Not just are they pleasing to the eyes, they are powerhouse of extraordinary planetary energy that can work wonders in life. This especially stands true of the navratnas or the nine planetary gems, the knowledge of which has been a gift to humankind. Featured today is a fine natural chrysoberyl cat’s eye of 2.25 carats set in sterling silver as a Ketu Talisman ring. 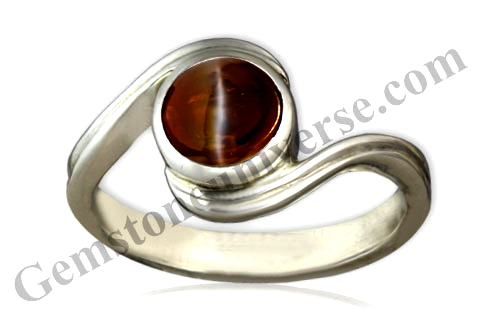 The natural cat’s eye gem from Madagascar has a fine honey brown color and good chatoyancy. 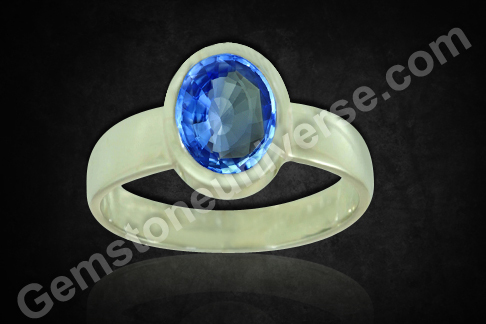 The gem is translucent and has been cut en cabochon to get the best display of the chatoyant band. Please take note that the underside of the cat’s eye gem is left unpolished and will generally be rough to allow for best surface display of chatoyancy. Cat’s eye chrysoberyl is a phenomenal gem that displays the optical phenomenon of chatoyancy – where a gold-white band of light appears to move across the surface of the gem as it is viewed in motion against a light source, giving the appearance similar to opening and closing of a cat’s eye. Chrysoberyl Cat’s eye is also referred to as cymophane, which is Greek for ‘waving light’. Natural cat’s eye, also known as vaidurya/ lehsunia/ bidalaksh is the gem of Ketu or the South Node of the Moon. 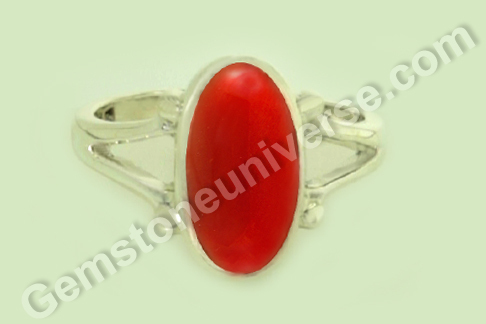 Among the planetary gems, cat’s eye is regarded as a very powerful gemstone and whose results can be witnessed fast. This gem should there fore be worn after a proper gemstone recommendation. 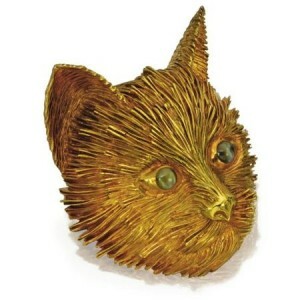 Cat’s eye is gemstone that is coveted by gambling aficionados for they believe it is capable of bringing them tremendous luck at games of chance.Enjoy the image of the 18 Karat Gold and Cat’s-Eye Chrysoberyl Cat Pendant/Brooch by Tiffany & Co., auctioned at Sotheby’s, New York in 2010 that fetched USD 17,500 . Comments It would only be befitting that gemstone of the Sun be as splendorous as the King of Planets himself. Natural ruby is a fascinating gemstone that symbolizes power passion and strength – all in the same breathe, and with quite a stately appearance. Featured today is a 1.44-carat fully natural unheated and treatment free Tanzania ruby. This cushion cut fine Africa ruby has been set in 22-karat gold as a Sun talisman ring, with the symbol of Sun standing in relief on the shanks of the ring. 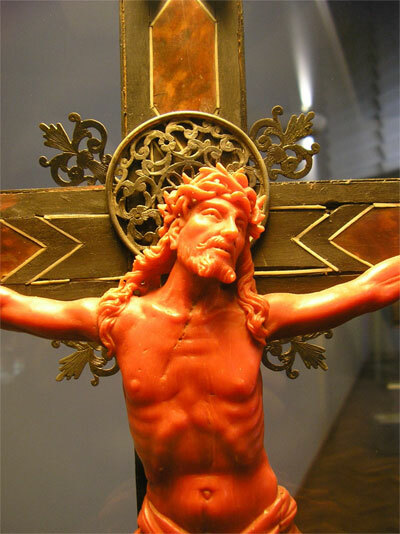 The natural ruby has the coveted imperial pigeon blood color, excellent clarity and fine lustre. The color is uniform in spread and saturation. Natural ruby from Tanzania is valued in the gem trade, for the ruby from this origin only comes the closest to the legendary Mogok rubies in color! Rubies, and in fact colored gems are proving to be the preferred investment option in a shaky economic scenario. With Gemstoneuniverse, you really have the price advantage where you get excellent jyotish quality gems at a far better deal. A modest search on Google for natural gems of similar quality and origins would give you the idea of what value Gemstoneuniverse is able to deliver! 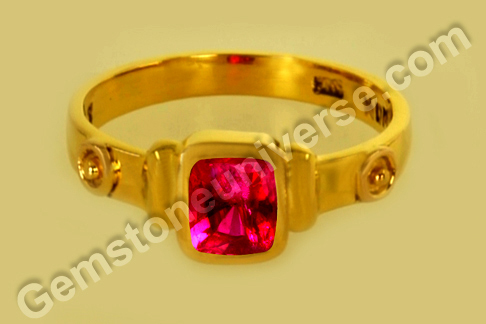 Natural Ruby or Manik is the gemstone of Sun / Surya and is used to harness his planetary energies. Comments Spectacular and stunning – the appeal of blue sapphire gem is amazing. It is a combination of mystical powerful aura and sheer gorgeousness of color that is hard to resist. Featured today is an extraordinary ring – an ornate and classy beauty, which has a natural and treatment free Ceylon blue sapphire at its center. 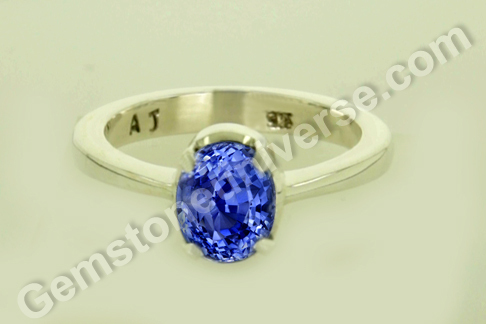 The oval shaped unheated blue sapphire from Sri Lanka of 2.49 carats has a rich and alluring deep royal blue color. The gem has excellent clarity and lustre. The centerpiece is surrounded by 22 natural flawless diamonds weighing a total of 0.629 carats that accentuate the beauty of the natural Ceylon sapphire. In Vedic astrology, natural blue sapphire or neelam is the gemstone of Lord Saturn / Shani and is set in a talisman to harness his saatvik energies. Natural Colored gemstones are increasingly becoming a preferred choice of celebs world over. Not only is there the starry appeal about these gems, there is also the great value of investing in the gem itself for nothing gives an ROI like a natural certified gem! 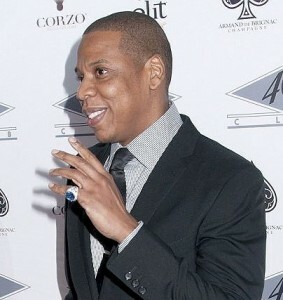 Earlier this year Beyonce and her husband Jay Z were both spotted sporting enormous blue sapphire rings. Looks like the colored gemstones are on the way to finding rightful glory. Beyonce’s blue sapphire has tiny blue sapphires as accent stones while Jay Z has diamonds working the magic to bring out the color of the blue sapphire in his ring. Natural sapphire is considered as the birthstone for the month of September and is very popular for its rich appeal and allure. Featured today is a gem that has the ‘wow’ factor – a premium natural unheated and treatment free Ceylon blue sapphire of a great jyotish weight at 3.08 carats set in sterling silver as a Saturn talisman. 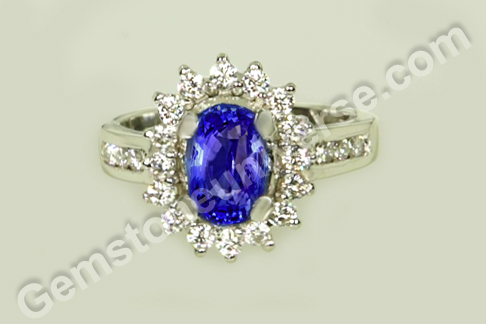 The oval shaped gem has a fantastic imperial royal blue color and excellent clarity. The sapphires from Sri Lanka are known world over for their medium blue tones. 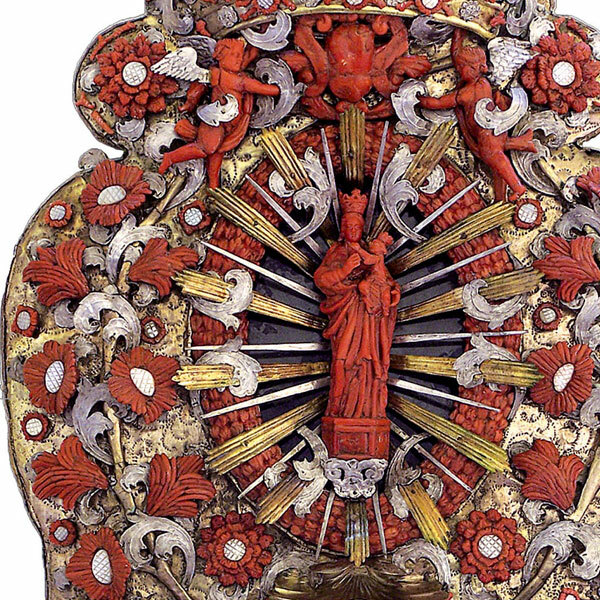 But this one steals the show with its rich color that seems to have just the right amount of color to make it a prized piece. In Vedic astrology, natural blue sapphire or neelam is the gemstone of Lord Saturn / Shani and is used to harness his saatvik energies if well placed in an individual’s birth chart. The gem featured today is a striking gem and has resonating Saturn energies for best results in planetary gem therapy.